Gig Harbor, Washington is just an hour’s drive from Seattle. It’s a beautiful town, bustling with tourists who flock to the numerous antique stores and restaurants. Its higher-than-average amount of rainfall and moderate climate results in lush greenery, abundant flowers, and colorful blossoming trees and bushes. Dinghy at Gig Harbor, Washington. 13×19 inch black and white print produced with archival, museum quality materials. The harbor is lined with boats of various sizes and purposes. Nestled among them are a few simple dinghies and rowboats. This one caught my eye just as a drizzle of rain started. 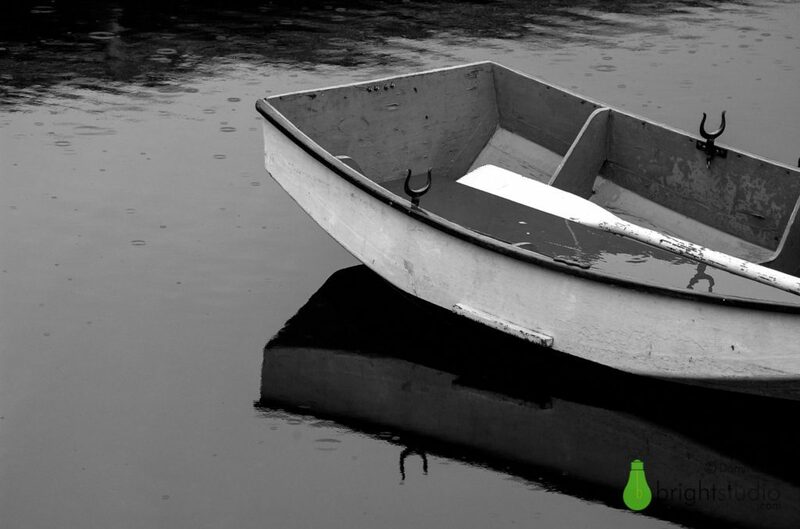 I was drawn to the shape and contrast of the boat, and the reflection among the raindrops in the still water. I’ve always been drawn to the water, but the closest I have come to living on or near water is during my childhood in Detroit, where our house near downtown was about a mile and half from the Detroit River. Although the Detroit River is hardly competition for living on the ocean, I didn’t realize how lucky I was to be able to walk to a major waterway and view passing freighters. My current home state of Montana has many beautiful lakes and rivers, but there’s something about a major waterway or a coastal town that holds a special allure. During this visit to Gig Harbor, I took numerous shots of bigger boats and views of the harbor, but this simple image was my favorite. When I look at it, it takes me right back to when I shot it. I can feel the cool, rainy air, and smell the water and blossoms. That’s one of the things that makes photography a kind of magic; it doesn’t just freeze light, it captures a slice of time with all its associated feelings. Museum-quality13x19 inch prints are available in the shop.